William Muggeridge was born at Elstree, Hertfordshire on 22nd September, 1884, the eldest of six children. His father came from Banstead in Surrey, where the family name appears in 1563 in the very first register of births and deaths of the Parish Church of All Saints. His mother was one of the Burrells, a well known West Sussex family. He became interested in photography in 1901 when he bought the 'Wizard' double-extension glass-plate camera, along with all the cumbersome appurtenances of the era. This was to serve him for a lifetime. He took a photographic magazine, called 'Focus', and in the January/June 1904 issue there was an illustrated article on windmills, by J. H. Crabtree, which aroused his interest. He was particularly taken by a picture of Lacey Green mill, wrongly captioned 'Princes Risborough', but known to him thereafter by that name. 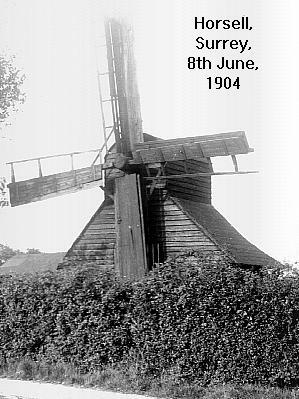 On 8th June 1904 he photographed the quaint little wind-powered saw-mill then working on Horsell Common, near the family's Surrey home. On the 19th June he ventured further afield on his bicycle to the old postmill at Stokenchurch, and a week later on 26th he set off for 'Princes Risborough'. On the way he took photos of Beaconsfield, Coleshill and Wendover mills, and when he reached his objective, he saw on the distant skyline the turning sails of Bledlow Ridge, a mill previously unknown to him. He went on to visit that too. At the end of the trip an enthusiasm had been fired which was to last a lifetime. In the 1920s, at a time when there was little public interest in windmills, and in an effort to stimulate this, he wrote a series of illustrated articles in the Sussex press. In 1926 this led to his photographs being made available to the Sussex artist, P.B. Adnams, who had been commissioned to make pastel drawings of all the extant windmills of Sussex. 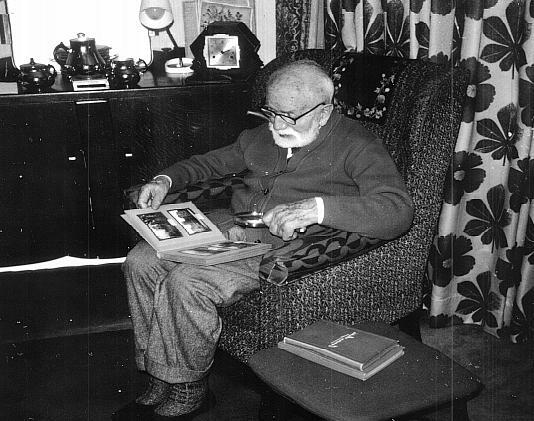 In retirement, in Devonshire, from 1944 until his death in 1978, he still actively pursued his interests. His son Donald initially deposited his father's collection of approximately 1,000 photographic glass plates, of which about 400 were of windmills, with the National Monuments Record (later RCHME). However in an attempt to make the images more accessible these were transferred to the University of Kent some years later. Prints were made from the windmill plates, and an exhibition staged in 1991.